India and Turkey are traditional suppliers of raw opium to the world. India is yet to adopt the new technology while Turkey did it in 1974. Across India, Agricultural crises topple the lives of our primary producers. But opium is one commodity where farmers have to brave it out slightly more than others owing not just to the erratic weather but also to equivocal procedures, despite the fact that they are engaged in its legal cultivation. This is compounded by the growing pressures from the well-entrenched black market around opium husk as a recreational drug. This should be a matter of concern given the importance of opium. Poppy is not only a commonplace household ingredient world over, but is also processed by pharmaceuticals to obtain essential alkaloids like morphine, thebaine, codeine, etc., which form the basic composition of most pain-killers, cough syrups and chemo-drugs. So, the demand always tends to be more than the supply, necessitating imports. It goes without saying that clearing procedural drawbacks would result in enhanced productivity of over 60,000 farmers, self-sufficiency and swift expansion of our export potential. Opium is a narcotic obtained from seed pod of a poppy plant. Though opium has many medicinal properties, more often than not, it is used as a narcotic substance in itself as well as to produce heroin and other artificial opioids. Opioids have a major effect on brain and spinal cord. Though its medicinal effects cannot be denied, if used in wrong quantities or form, opioids have negative physiological effects ranging from slow heartbeats to suppression of cough reflex. Opium is an addictive substance, and thus its usage needs to be regularized. The foremost example of unauthorized and irregular opium usage is the state of Arunachal Pradesh where opium cultivation and abuse has become an epidemic for the state government. 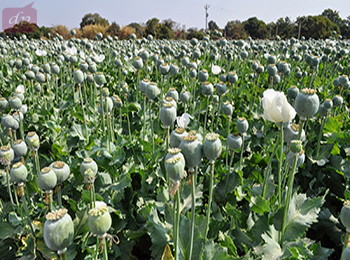 The Narcotic Drugs and Psychotropic Substances Act (NDPSA) empowers the Government of India to allow and regulate the cultivation of opium poppy for medical and scientific purposes. The Government notifies the tracts of land where opium can be cultivated along with the general conditions for issuance of license every year for the same purpose. These notifications are referred to as Opium Policies. Prima facie, opium is produced legally in India on notified tracts through a licensing system, in the states of Madhya Pradesh, Rajasthan and Uttar Pradesh, and this is monitored by the Central Bureau of Narcotics (CBN). The entire produce is to be mandatorily tendered to the Government, and fixed prices are paid to cultivators in slab rates. Under the current opium policy, growers have to request for crop destruction if their harvest is less than the Minimum Qualifying Yield (MQY), which can result in revocation of their license. The main grievance is the rule of uprooting the entire calamity-struck, non-harvested crop, instead of allowing the farmers to extract poppy seeds from the good crop portions and sell it in the open market or to licensed contractors. This is in stark contrast to the appeasing habit of providing compensation to the farmers of other crops if they have to face adverse weather conditions. Every year, there are some growers who approach the CBN with crop destruction requests. But the extended dry spell last year saw only about 1,000 of the 19,651 licensed cultivators agreeing to harvest the crop, which is sown during late-October and November and is ready for lancing in February. As per the opium policy of 2016-2017, cultivators had cultivated opium poppy the previous year and tendered an average yield of opium of a minimum of 49kg per hectare in the states of Madhya Pradesh and Rajasthan and an average yield of not less than 47kg per hectare in the state of Uttar Pradesh. Mandsaur, in Madhya Pradesh, accounts for almost two-thirds of India’s produce. In 2011-12, there were 27,382 farmers who were granted permission to cultivate opium in 873 villages. The yield was 4,78,412.205kg and the payment released was of ₹57.47 crore. The narcotics department operates two processing plants at Neemuch and Ghazipur. Opium collected from farmers is sent to government-owned factories at Neemuch and Ghazipur for final analysis, drying and processing. The factories convert a part of opium for supply to medicine manufacturers. The balance is exported as raw opium to the US, Japan, Hungary, the UK, France and Thailand for medicinal purposes. The US reduced its import from India. Opium exports from India have decreased from around 480 metric tons in 2007-08 to 170 metric tons in 2014-15. Therefore, production of an important commodity, for which there is immense domestic and international demand, hinges on these discouraging rules for its producers. The CBN justifies this as an attempt to curb smuggling, black-marketing and health abuse of the narcotic by-products (husk). This brings us to another pertinent regulatory issue. Opium is one of those rare crops which involve not just farming, cultivating, climatic and marketing issues, but also health and welfare, smuggling, illicit manufacturing and organized crime issues. The current supervisory body is the CBN under the Ministry of Finance, which is primarily concerned with narcotic abuse. But opium cultivation requires a nodal body to collaborate with a wide spectrum of ministries (like commerce, health and welfare, agriculture, etc.) to take holistic executive decisions. Opium cultivation is very tedious and the plant is fragile and easily suffers damage due to natural calamity, rain, hailstorm, diseases, etc. Besides, fulfilment of minimum qualifying yield (MQY) criterion, specified in number of kg per hectare by the Central Bureau of Narcotics, is often difficult to meet. Stringent departmental supervision, rules of Narcotic Drugs and Psychotropic Substances Act, and economics of the trade are making farmers turn their back on opium. The Narcotics Act is very stringent and licenses are easily seized if the production is less than specified. Earlier, the MQY fixed by the narcotics department was 6 kg per bigha, but now it has been increased to 15kg. After opium-producing countries like France, Australia and Hungary adopted advanced technology of opium extraction from the concentrate of poppy straw (CPS) it has boosted their opium economy. Opium exports from India have come down from around 480 metric tons in 2007-08 to 170 metric tons in 2014-15. The US reduced its import from India from 375.76 metric tons in 2007-08 to 69.50 metric tons in the last fiscal year, as per the data maintained by the government. It stood at 421.32 metric tons in 2008-09, 336.43 metric tons in 2009-10, 392.158 metric tons in 2010-11, further declining to 339.85 metric tons in 2013-14. India was previously the largest exporter of opium to the United States. India and Turkey are traditional suppliers of raw opium to the world, but while Turkey moved to CPS in 1974, India is yet to adopt the new technology. Opium being a very viable option to increase the generation of revenue in India, the government must take measures to increase the acres of land allotted to farmers for opium cultivation, increase the number of licenses issued every year, as well as increase the time period of the licenses granted. Only when these clarities are brought at the watchdog level, will there be a favourable outcome for all stakeholders. Till then, the farmers will hopefully bring themselves together into a cooperative, since an organized, consolidated voice begets greater enthusiasm from the State, thereby pushing the envelope on this cause.